Chantal is a planner, and her summer-before-senior plan requires best friend Jillian, resume updating, and studying for AP classes. Jillian wants something different, and is afraid to leave introverted Chantal in the dust. All that changes, though, when popular classmates Parker and Will suspiciously start hanging out with the girls. Chantal only sees one thing: Jillian ditching her for Parker- a guy who can't even be trusted! Chantal's new plan will expose Parker and Will for what they truly are, and along the way, get her best friend back with the littlest lie and a lot of mouthwatering cake. After all, what are best friends for? Wicked Sweet. Great beach reading!! This book will keep your attention and you'll love reading the four points of view– Chantal, Jillian, Parker and Will. You don't expect what happens in the end. The author uses four points of view which I like and I really like the two main characters, Chantal and Jillian. 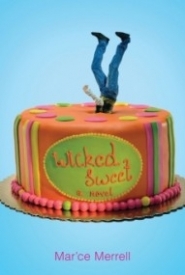 You think it's going to be sweet and sort of lightweight, but there's more to this book than the cake. We get to see relationships between best friends, guys and girls and unexpectedly realistic scenes between the main characters and their mothers. It's a great read for the beach, long and fast paced. Lots of great baking.